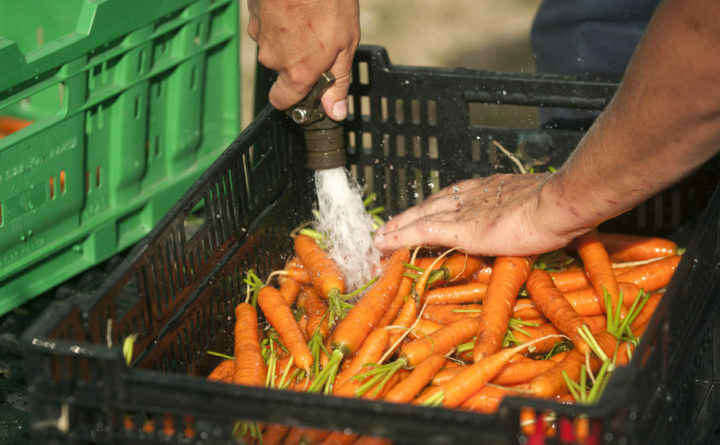 Tom Wolf a farm apprentice from New Orleans, Louisiana, washes carrots at the Four Season Farm in Brooksville. If you’ve ever dreamed of homesteading but don’t know how to get started, a farm apprenticeship is a great way to learn skills, meet experienced farmers and try your hand at the homesteading life. The Maine Organic Farmer and Growers Association (MOFGA) has an apprenticeship program targeted at young adults with and without previous farming experience. Host farms are members of the association and located throughout Maine. Applications are rolling, but most farmers are looking for apprentices that can commit to an entire growing season, between March and October. Download an application online. You can apply for up to 12 farms with your application. Search for participating farms on the MOFGA website. Apprentices work five days a week and are provided with a room on the farm with a communal kitchen and bathroom, a monthly stipend of $800 and home-cooked meals during the work days. The apprenticeship runs from March 15 through Nov. 15. Previous farming experience is not necessary, but applicants must be at least 21 years old, non-smokers, have a reliable vehicle and be able to lift 50 pounds easily as well as squat, crouch and bend over for harvesting. Applicants also must also demonstrate the grit, passion, stamina and adaptability required to be a successful farmer. To apply, e-mail Marieta Easley at sliceofheavenfarm@gmail.com to request an application. Applications are due Feb. 1, 2019. Farm experience is not required, but the owners Jim and Annie Schultz, are looking for curious farmers who are honest and reliable with good interpersonal skills who are comfortable interacting with CSA members customers at farmers markets, volunteers and student work groups. The internship entails about 45 to 55 hours of work per week, and applicants should be willing to work in all weather conditions, be able to lift 55 pounds and have a valid driver’s license. Apprentices will receive room and board as well as a monthly stipend of $850. Phillies Bridge Farm Project is a nonprofit educational working farm that offers several apprenticeships in sustainable agriculture. They are currently hiring one full season farm apprentice for April through October and one summer farm apprentice for May through August. Farm apprentices will be provided with the foundational knowledge to pursue small-scale vegetable production, including seed starting, greenhouse management, bed preparation, crop maintenance, irrigation, high tunnel construction and tractor operation. Apprentices will also assist in the CSA distribution for the 140 member CSA and growing vegetables for local health food stores, restaurants and low-income families through the farm’s food justice program. Apprentices participate in Collaborative Regional Alliance for Farmer Training farm visits and can develop skills in crop planning, marketing, client relations and no-profit management. Apprentices will work 40 to 50 hours per week depending on time of year for a weekly stipend of $350, on-site housing and seasonal produce and eggs. Applicants should be responsible, punctual, hard-working individuals with good communication skills and a desire to learn who are able to comfortably lift 50 pounds and engage in repetitive physical work, no matter the weather conditions. OK, maybe this one is a fantasy, but if you have the means to take your life to France, consider applying to the La Ferme du Chou Beni (translation: the Blessed Cabbage) apprenticeship for the spring and summer of 2019. The farm in the Dordogne region of France focuses on regenerative agriculture, using traditional crops and animals from the area for their organic fruit, wine, and livestock farm based around pigs, cows, vineyard and cider orchard. Experience in organic farming or natural building is preferred but not required, and apprentices are required to commit to a minimum stay of three months. Apprentices will be provided room and board, most meals and 750 euros per month in exchange for 35 hours of work per week for a single apprentice (couples are expected to work 25 hours per person per week for 900 euros/month). Apprentices will also have access to a bike, canoe and van for trips into town and recreational excursions.